Monash BDI's Dr Eliana Mariño with Dr Jeremy Barr from the School of Biological Sciences. Did you know that 1-2kgs of your weight is made up of around 38 trillion microbes? Melbourne Museum launched the Gut Feelings exhibition on Friday 15 March, offering visitors a chance to discover helpful gut microbes, walk through the gut tunnel and find out how microbes affect our thoughts, behaviour and bodies. This visually stunning exhibition explores new revelations that our minds, guts and microbes are inextricably linked. Multisensory installations and object displays highlight the power of the human body’s ecosystem – the helpful microbiome. 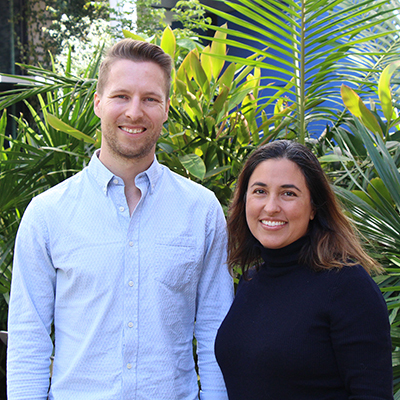 Two experts in gut microbiota from Monash University were involved in the preparation and editing of the exhibition, Dr Eliana Mariño from the Monash Biomedicine Discovery Institute (BDI) and Dr Jeremy J. Barr from the School of Biological Sciences. At the launch, they interacted with members of the public and discussed the importance of the gut microbiome. Dr Mariño discussed with guests the power of prebiotics, her latest work on type 1 diabetes, how a healthy diet is critical to promote the production of microbial short chain fatty acids and its impact on the immune, nervous and hormonal systems. “Most of the people were interested to know how our gut bacteria can influence so many diseases such as obesity, diabetes, depression, infections, etc. and how important what we eat is to help our gut microbiota to make the right decisions when it comes to fight against diseases,” Dr Mariño said. “The most amazing part of the launch was listening to my son saying to me, ‘Mummy please teach me more about our bacteria’ that made my day because many kids will love it!” she said. Dr Barr chatted to guests about antibiotic resistant ‘superbugs’ and how his research on phage therapies may be a possible solution. He also chatted about pre- and pro-biotics and how these beneficial microbes may influence obesity, nutrition and even control what foods we crave. “Being a part of the ‘Gut Feelings’ exhibit was a lot of fun and extremely rewarding,” Dr Barr said. “I was really amazed at the number of people who were not only aware of their microbiome, but also genuinely interested in understanding how these gut microbes are impacting their day to day lives,” he said. Other Monash BDI researchers were involved in the preparation for Gut Feelings, including Associate Professor Michelle Dunstone, whose 3D-printed plastic model of a hole-punching protein ‘pleurotolysin’ is currently on loan to the museum for the duration of the exhibition. The Gut Feelings exhibition is on display in the Mind and Body Gallery of the Melbourne Museum, and will run until February 2020. Ticket information available on the museum website.